The strong influence of visual information on the perception of odors illustrates the dependence of smell on more reliable information… Our results tend to confirm that sense of smell is, by itself, unlikely to provide sufficient information to allow for a consciously reasoned decision. The true function of smell is probably sought elsewhere. Very long story short on this study: Frédéric Brochet, a Ph.D. student in psychology, took some oenology undergrads and had them taste and describe a red wine and a white wine. The next week, he had the same students back to taste more wine, but this time he put white wine in one glass, and in the other he put the SAME white wine with flavorless red food dye and asked them to describe the wines again. Nearly all of the students couldn’t tell that these were the same wines and most of them described the dyed-red white wine as if it were a red. And now, minimum once a year, some smarmy know-it-all writes a think piece for a major publication about how wine tasting is bunk. So, I decided to conduct my own slightly less scientific study. 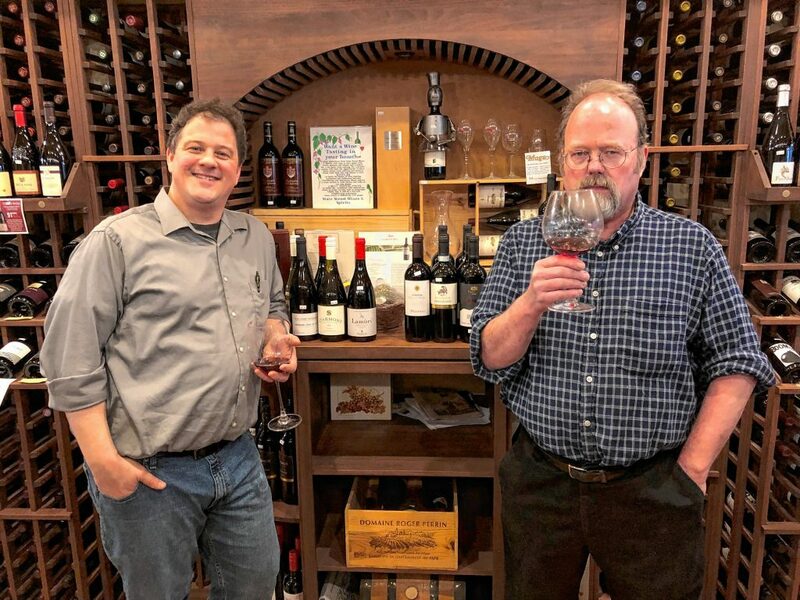 Every Thursday afternoon at 12:30, I drink wine with the Wine Snobs in what I call “The Wine Bunker” deep below State Street Fruit Store Deli Wines & Spirits. I’ve been doing this for more than a decade as a segment for my radio show on 93.9 The River. I’ve institutionalized day drinking into my work week. 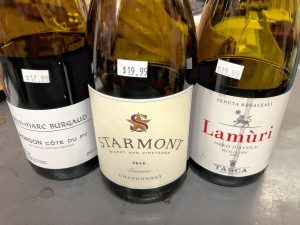 This particular week, the Wine Snobs: Wes DeSantis (aka The Wine Son) and Mark Hanson (aka The Wine Uncle) wanted me to blind taste them on any three wines in the store that were $25 or under. Recalling all the haters from The Color of Odors study, and seeing as we drink in a windowless basement bunker below a wine shop, I decided I would literally blind taste them in total darkness to see if they could, with only the benefit of smell and taste, tell the difference between a red and a white wine. The goal was not to trick them. I chose three wines that were typical of both the type of grape and the region. Starmont Chardonnay from Carneros in California, a region that toes the line between Napa and Sonoma. It’s white, of course. Tasca d’Almerita Lamùri Nero d’Avola Regaleali from Sicily, which is a red. And, because I know the Wine Son HATES the grape that makes this region famous (Gamay), I chose the Jean-Marc Burgaud Morgon Cote du Py from Beaujolais, France — another red. Each of these grapes have very specific and easy-to-perceive qualities and each of these regions have a particular terroir — or “somewhereness” — that should be definable even without the benefit of sight to any Wine Snob worth their salt. “Everything aromatically about this wine screams red wine to me. Definitely bright red fruit. Clear barrel aging and a wood influence,” announces the Wine Son, confidently. “And I’m going to say if this was a white there would be more minerality. More salt in the nose,” concurs the Wine Uncle. “Right now, I’m leaning towards it being a red wine from France.” Impressive. Most impressive. After agonizing for close to 10 minutes in complete darkness, ultimately they decide together that it is a Cabernet Franc from the Loire Valley. Not perfect, but so close. They correctly guessed both color and country. “I didn’t notice any poop smell in this wine, so I should’ve known it wasn’t Cab Franc,” says the Wine Son, “and I didn’t notice any strawberry bubblegum on the nose. That’s why I didn’t guess Gamay. But this is one of the best Beaujolais I’ve had.” High praise from someone who usually bemoans Beaujolais. The Wine Son seconds that emotion. “There is no question in my mind that, aromatically, this is a white wine.” The Color of Odors study be damned. “Honestly, I think this is a Chardonnay. There is a richness to this that screams California.” Screaming anything in this complete darkness might be terrifying, but Wine Uncle wins the day. I give them full marks in the dark. The last wine is the Nero d’Avola. I surmise this will be the trickiest one to divine blind. “Aromatically, this one straddles the line between red and white,” ponders the Wine Son. “I still come away thinking this is red.” Wine Uncle adds, “This is a really nice wine. It could be from Piedmont. It might be a Barbera.” Wine Son thinks it’s Nebbiolo. When I taste and smell it, I admit that it has a lot less black pepper than most Neros I’ve had and it has decidedly more cola. They are off on the grape but they have riddled out the color and the country once again — albeit the complete opposite part of this extremely diverse viticultural country. The 2001 Frédéric Brochet Bordeaux study took 54 undergrad students who were studying wine and put them to the test. Almost all of them failed miserably. But what do you expect from undergrads? Particularly ones who have chosen to actually study alcohol rather than just drink unsafe levels of it. When I put two wine professionals, Wes DeSantis and Mark Hanson, from State Street into this literal blind tasting in total darkness they have proven, perhaps less than scientifically, that all of those major publications can take their snarky articles and shove them up their nose, where they will likely be able to tell even without the benefit of sight that their articles are garbage. And, by the way, what does the former Ph.D. student in psychology Frédéric Brochet do now? He’s a winemaker. If you want to listen to the Wine Snobs tasting in the dark, the podcast lives here: https://wrsi.com/monte/literal-blind-tasting-in-the-complete-darkness-with-the-wine-snobs. Tweet Monte Belmonte at @MonteBelmonte.